Real Jadakiss fans waited patiently when they learned that his upcoming album “The Last Kiss” was slated to hit stores this year. Most anticipated to witness the reunion of the L-O-X and D-Block via features on this LP while others just breathed a sigh of relief. Real hip-hop was back. 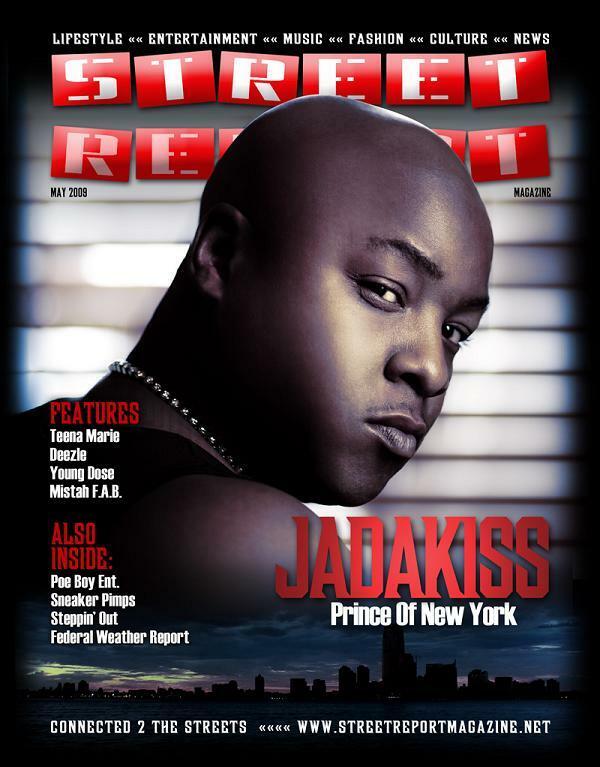 Lacing the interview with his mellow demeanor and charming conversation, Jadakiss shares with me why his apparent hiatus was not in vein, breaks down his views on the digital revolution and why his latest album is far from the last that you will hear from Kiss. TK: Where does your name come from? JK: One of my man’s on my block gave it to me one day. My real name is Jayson, so he was on his cell phone and I guess someone was asking him who he was on the block with and he said everybody else’s name and then he said “yeah, and that kid Jadakiss.” I was like what? Jadakiss, ya know? I went home, threw it in a rhyme, the ladies loved it, and that did it. So that stuck with me ever since. TK: Many have been waiting ions for your latest album “The Last Kiss”. How important is your latest album to your career? JK: Oh, it’s definitely important, you know what I mean. The third one is a charm but I stayed away so long I didn’t know how they were going to accept it. TK: So have you been happy with the way people have welcomed you back and how the fans have responded? JK: Definitely. It’s a blessing from up above to take five years off and come back and get this kind of love. TK: In the time that has lapsed since your last album, what has changed to you in this industry? JK: Ring tone rap. Digital technology of the whole game and just the way that the money, the recession. The less marketing budgets, the less, ya know everything. TK: So how has it been for you to adjust to the whole social media thing? Do you use facebook, myspace, twitter? JK: I love it. It’s beautiful. I love it now. TK: Hold on, now you say now like before you where a little hesitant. JK: Yeah, now before I wasn’t working on any projects so I wasn’t, ya know. I was just flirting around with the internet. I needed it. When I needed it to work to my advantage and I saw how it could help, I love it. I mean, I got up on the how sites and got up my own website going and start logging on to the world I see what kind of advantage and I see what’s going with it so ya know, I’m just trying to make that happen. TK: Now, are you on twitter? TK: Okay, okay. Cause you know there are a lot if prototypes out there so I just wanted to go ahead verify that and go ahead and clear that up for everybody. So it is @therealkiss? JK: Yeah, I got about 40 or 50 thousand followers right now. TK: When you started promoting for this upcoming album, what were some of the question that you were asked the fans? Where they like “Damn Jada, where you been?” How were you received by your fans? JK: Thank you. Thanks for bringing this type of music back. TK: Really? So it was more like a sigh of relief. JK: Yeah, like thanks for letting us be able to breathe again. Thanks for giving us some music that we can listen to through the whole CD instead of one song. TK: Speaking of that, you have a lot of features on your new album. Who gives you that automatic vibe in the studio? Out of all the people that you have worked with, who has the best vibe in the studio? JK: I would say Stylez and Sheek got the best chemistry. Nah, I work good with everybody. I’m a people person. I am not that hard to work with. TK: Do you need a certain mood or to be set or do you have any particular requests when you record? JK: Yeah, I need water. I always keep water. TK: What inspired the collaboration with OJ da Juiceman on your new album? JK: Juice is my man. He’s a new artist, ya know what I mean. I was definitely trying to get Gucci but he got locked up. So I knew OJ was his artist that I knew he was breaking him and besides that he got a hot buzz in the south and the Midwest. He talks about the same type of stuff that I like to talk about, just on the down south perspective. So I wanted to throw him on that joint with Swiss and it came out to be hot. I just shot the video two days ago in Harlem, so you should look for that in a minute. TK: How does it feel to be the only one to be thoroughly carrying NY on his back? JK: Ya know, it feels great ya know what I mean. I don’t know how true that is. I just try to represent. I try to represent for myself and for the fans that love me, that ride out with me and tell me to keep making music and real hip-hop heads support me. TK: What is some advice that you would give to up and coming artist on staying relevant even when times and music is changing? JK: Step outside the box. Step outside your demographic. TK: How do you think that you have done with that? JK: I move around a lot. I’m out west, down south. I’m everywhere, you understand? I don’t stay in one place. That’s how you find out what hot in all the areas. You hop on songs that are not reaching New York. You take of New York first and then you move out to see what’s hot and cover the spread and you’ll alright after that. TK: Everybody wants to know how the relationship is with you and P. Diddy as of now? JK: Diddy is my big homie. I learned a lot from him. I learned that the game is just business and you got to make sure that your business is right before anything. TK: What are some of the trends that just trip you out right now in hip-hop? JK: Some of the fashion trends. They might be crossing borders a little bit. TK: You have to give me an example. JK: Some of the pants. Yeah, I’m not with that. I can wear them tow sizes bigger but I can’t do them two sizes smaller. TK: It’s just the pants that bother you? Not the shirts, and the colors and everybody is just stepping out of the box with everything but I don’t even know if that box should be opened half the time. JK: Yeah, you said it perfectly. That was marvelously put. TK: Where do you see hip-hop music 5 to 10 years from now? JK: I think it’s going beautifully. TK: What is some of the music that you are vibing to right now? JK: I listen to everything. I listen to a lot of nineties music like Reasonable Doubt and of course BIG. TK: Do you have any tours or anything coming up? JK: Me and Cam are doing the Big Bosses tour in June. TK: Any final words to your fans? For the full interview and others on Keri Hilson and Juelz Santana, log onto www.streetreportmagazine.net and order your subscription NOW! I LUV THIS CD….J to the MUAH KILLED IT!!! !